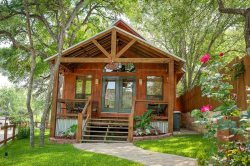 Our New Braunfels vacation rentals are a great getaway for the golfer in your family. Located near two of the best courses in Texas Hill Country, you can enjoy the gorgeous surrounding scenery while you work on your short game. The Bandit Golf Club is on Lake McQueeney, with a beautifully designed course for all ages and skill levels. Nearby Landa Park Golf Course is in the Historic District on Comal Springs, offering a tranquil course atmosphere at an affordable price. They even host private events! Check out their websites to book your tee time, and start planning your stay with New Braunfels Leasing and Resorts! The Bandit Golf Club is situated off the shores of Lake McQueeney, an easy 30-minute drive from downtown San Antonio. Book your tee time today! Texas Hill Country golfing at its best!